The McHenry County College Multicultural Affairs Office was recently presented with a "Reflecting Excellence" award from Reflejos newspaper for the second year in a row for hosting a Latino Empowerment Conference. This year’s conference attracted 321 high school students from nine local high schools. Students and staff who attended an awards banquet in Hoffman Estates to accept the award are pictured, from left, Hedaya Ghareeb of Woodstock, Jacky Carbajal of Woodstock, Elizabeth Rosiles, coordinator of Multicultural Affairs; Annie Velasco of Woodstock, and Patrice Jones of Woodstock. 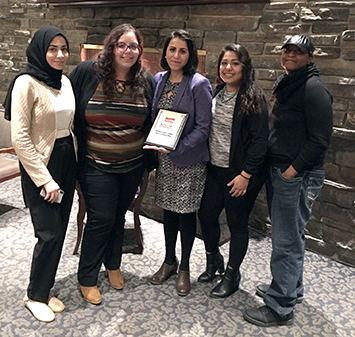 The McHenry County College Multicultural Affairs Office was recently presented with a “Reflecting Excellence” award from Reflejos newspaper for hosting a Latino Empowerment Conference. This year’s conference held earlier in the year attracted 321 high school students from nine local high schools. “This is the second year that MCC’s Latino Empowerment Conference has been recognized by Reflejos readers for the impressive impact it is having on our students,” said Linda Siete, manager of Sales & Operations at Reflejos. “This event has inspired students to pursue higher education, increased their awareness and motivated students by hearing inspirational stories from graduates about how higher education improved their skills,” Siete said.